Made a stop at the post office this week and I’m hoping the bank and the water company appreciate the friendly face along with their check. 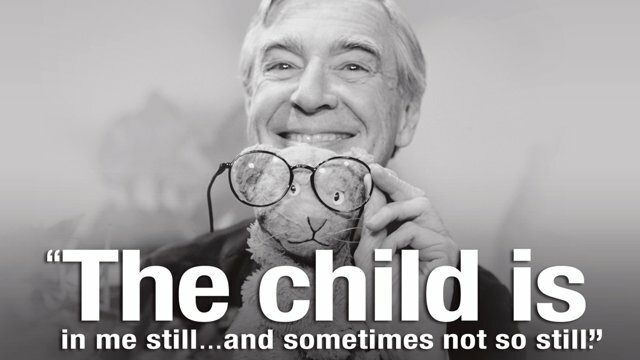 Today, Mr Fred Rogers would have been 87 years old. 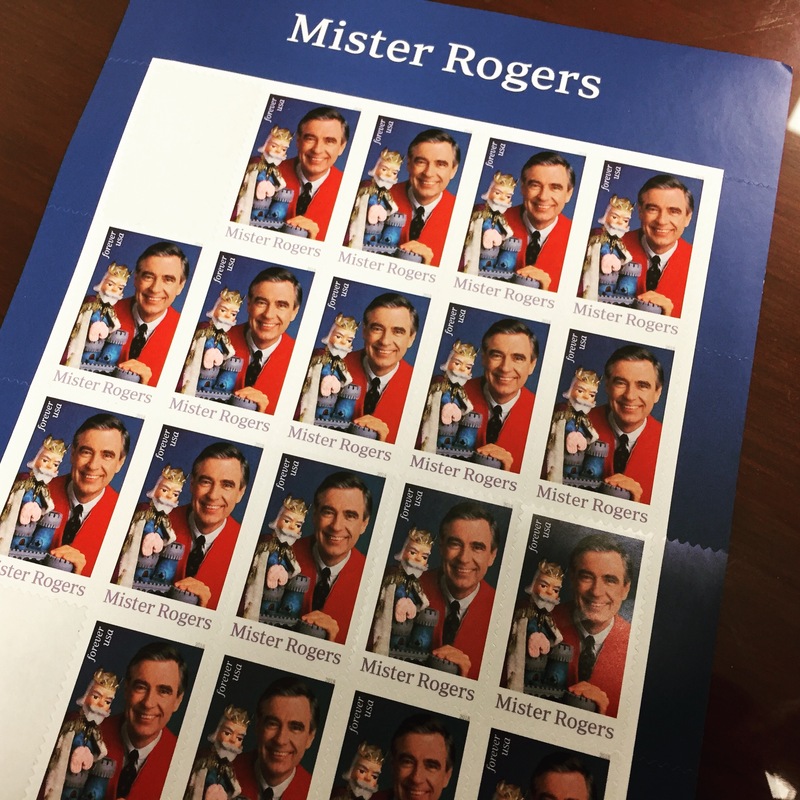 While the gentle “Won’t you be my neighbor?” has, over the years, sometimes turned into a bit of a sarcastic punchline in pop culture, Mr Rogers himself, and the lessons and values that he presented, left a lasting impact on my life, as no doubt it did countless other lives over the course of multiple generations. I was about 3 or 4 when I first joined ‘the neighborhood.’ My brother was just born/was a baby, and we lived in a two-family apartment building in an area of our city that, while maybe not that great, was home. I still remember running from one of the apartment to the other when Sesame Street would end, grabbing my sweater and sneakers because I knew what was up next. And as Mr Rogers walked through that door and greeted us viewers, I sat in the living room of our apartment, putting on and zipping up my little sweater along with him, and tossing my sneaker from one hand to the next. I wanted to be just like that guy, I would think. 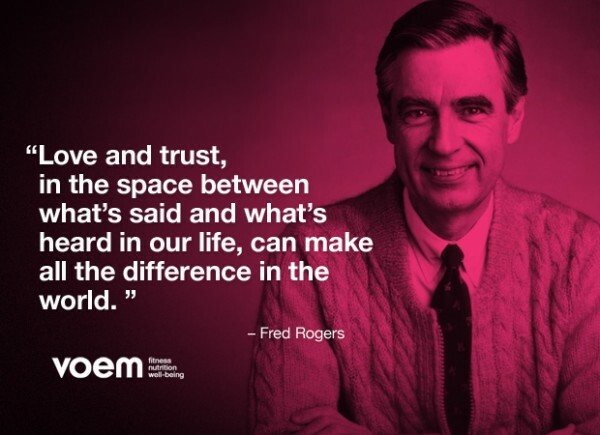 As I got older and grew out of the daily routine of my Sesame Street/Mr Rogers TV block, the values that came from them remained, even if I didn’t realize it. No, I would have to wait until I was a great deal older, and much more introspective about myself and my life before I would see that. But now I do. I realize that while I was watching with a childhood curiosity and thirst for entertainment back then, what I was getting was a reinforcement of values and morals that taught all of us what it meant to be a good person. It was really special. I knew it then, even if I didn’t know why. And while it took a few decades later and becoming a father myself, I know it again. 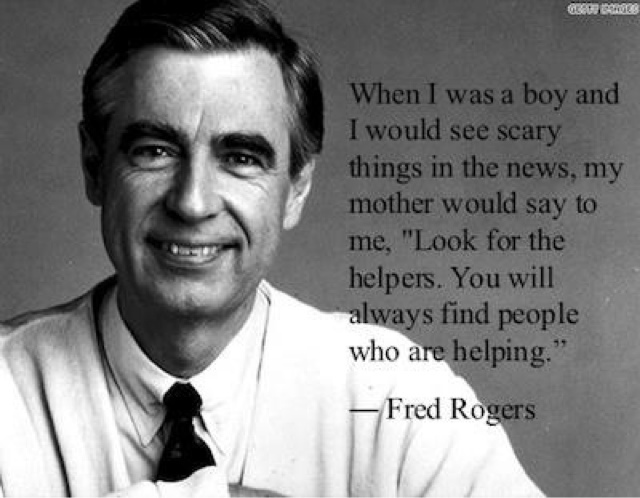 Thankfully, those lessons are being taught to new generations today through Fred Rogers’ Company in shows like the animated Daniel Tiger’s Neighborhood. 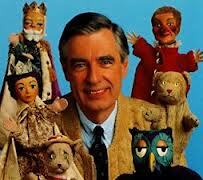 So thank you, Fred Rogers, for all you did for me and for so many other kids over the years. For teaching us, not our ABCs or 1, 2, 3s, but how to be kind, why to be kind, and how to help. All endings are new beginnings – just one quote among many that I’ve been finding very inspirational as of late. My son recently pulled a book off of our bookshelf and handed it to me. Whether he thought it was one of his enjoyable adventures through Elephant and Piggie’s world or another attempt by cows to type in Click, Clack, Moo, I’m not sure. Or, perhaps the little wise one just wanted to drop some philosophy bombs on his old man. 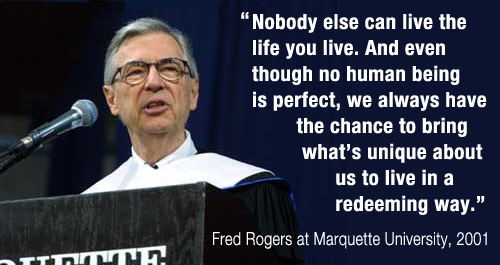 The book he handed me was “The World According to Mister Rogers” and is filled with almost 200 pages of quotes and thoughts on life from the man himself, Fred Rogers. I can’t quite remember if it belongs to me, my wife, or if one of us bought it for the other some time back. Regardless, it was a pleasant surprise to have the wee one hand it over recently and plop down in my lap as I opened it up. While after a few minutes of me reading through quotes, the little guy’s attention moved on to something else, I’ve had the book with me ever since, leafing through page after page of wisdom from Fred Rogers and can only say that as I read more, I am more and more impressed. I keep asking myself how I can start embracing his view of the world as my own. I think if all of us did, boy, what a world we may live in. Maybe that’s a pipe dream. But if I can do my best to do so, then maybe it’s a pretty good example for my son to see and perhaps do himself before passing it along to another generation and so on and so on. Around the time I was pre-school aged, as well as before, my day was incomplete if it didn’t involve a visit from Fred Rogers. 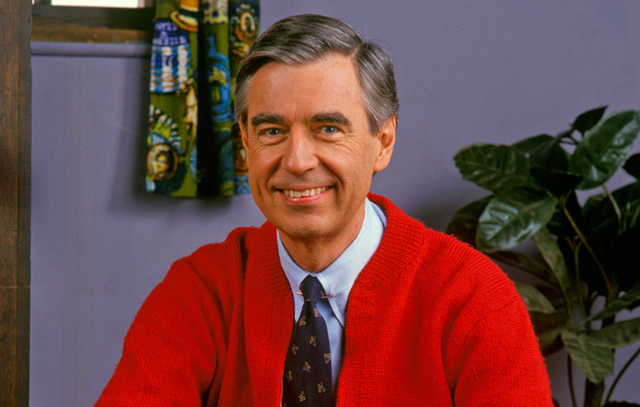 I even had a sweater and pair of sneakers that I would pull out of the closet at the start of each show, climb onto (what seemed at the time to my little eyes) our massive couch, and get ready along with Mr Rogers as he welcomed me and countless other kids to the neighborhood. I watched, I sang, and I learned, even if I didn’t know it at the time. I walked away from those years of my life with some amazing lessons in morality, ethics and courtesy, all thanks to a man who was willing to treat his audience of children as actual people and not talk down to them. 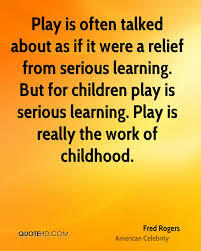 I have a deep admiration for Fred Rogers, his vision and what he did for millions of children over various generations. 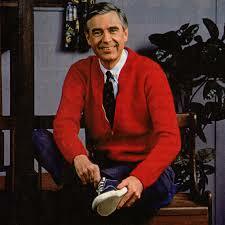 Where we live, Mr. Roger’s Neighborhood is no longer in syndication. If, like me, you watched as a child, you probably remember the Neighborhood of Make Believe – the magical world accessed via the trolley, which would leave Mr. Rogers’ den, go through the wall and introduce us to the likes of King Friday, X the Owl, Henrietta Pussycat, Daniel Striped Tiger and more. For this latest generation, Daniel Tiger is the son of Daniel Striped Tiger from the original program. We don’t let my son watch a lot of television. He’s a baby, after all. However, Sesame Street and Daniel Tiger are rare exceptions, and are in small doses. I actually got a little emotional recently when I was home with him and we were watching it together. He was cooing and laughing, and as I watched and heard those familiar chimes of the trolley welcoming us to the neighborhood, I was overwhelmed by how touched I was. I once sat watching Mr. Rogers with my mom and dad, and here I was, with my son, watching the next generation’s equivalent. 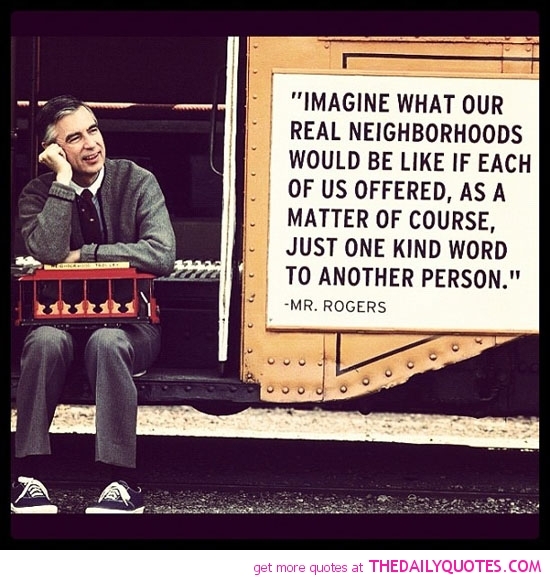 It made me so happy, so touched, and so thankful that the vision of Fred Rogers lives on in any form. 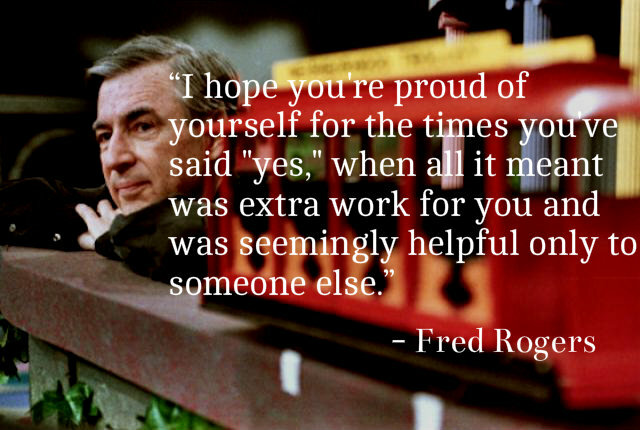 Children need people like Fred Rogers in their childhood and now that I’m a parent I need him there for them too.